Range: There are five groups of beluga found in Canadian waters, including the St. Lawrence River population. The other four populations are: the Cumberland Sound population, which is threatened, Eastern High Arctic/Baffin Bay, which is of special concern, and both the Ungava Bay population and the Eastern Hudson Bay population, which are both listed as endangered. Diet: Belugas eat octopus, squid, crabs, shrimp, clams, mussels, snails, sandworms, and fishes. To navigate and catch prey, belugas use a series of clicking sounds that bounce off fish and other objects in the water. This is called echo-location. 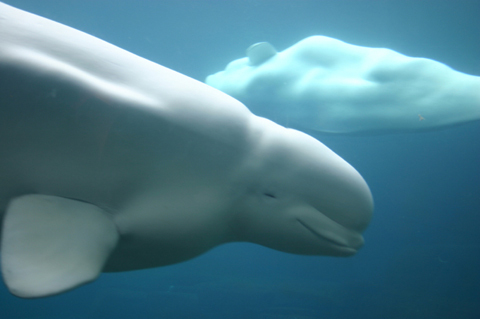 The resulting echoes enable the belugas to build an accurate picture of what’s around them. Males reach sexual maturity at 12 to 14 years, while females become sexually mature from 8 to 14 years of age. Belugas breed about every three years, between April and June. A female gives birth to one calf (about 1.5 m long) around July or August, after a gestation period of 14.5 months. A jump in the number of St. Lawrence belugas washing up on shorelines has scientists puzzled. Beluga whales congregate each summer along the southwestern coast of Hudson Bay in the tens of thousands. Photographer Paul Colangelo drops in for a one-of-a-kind view of their annual gathering.